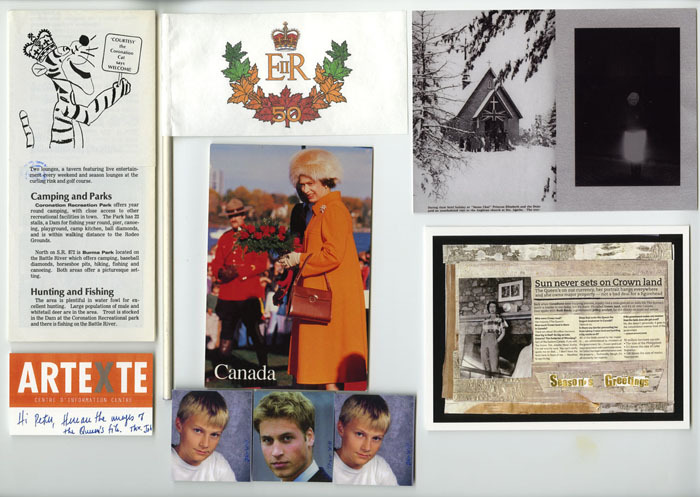 Peter Trepanier clips newspapers, takes photographs, makes cards, and collects paper-based ephemera relating to the Queen. With the help of student volunteers (who were allowed to make most of the placement choices), he posted all of the material that appears on the attachments clustered in a random-like fashion on a WPPS wall. The arrangement was intuitive and spontaneous. Its surface size was roughly 100 x 130”. The unidentified published items are almost exclusively from recent Canadian sources and provide a Canadian point of view. He also produced a business card for book fair attendees to pick up; similar to the one featured in the upper right on p. 1. Images from previous installations are featured as part of the piece (“Swarm”/Project Window, Ottawa – 2010, p. 3 and 4; “The Role of a Lifetime” /ARTEXTE, Montreal - 2008, p. 12.) The work uses the wall space as a publication lay sheet. Elizabeth R of Canada links our countries because we share a monarch who is celebrating her diamond jubilee this coming year. The business card acknowledges a common practice of exchanging cards at fairs.